10.29.2013 My collectibles show-and-tell is usually some treasure that Jim acquired, but this one is my own family heirloom. 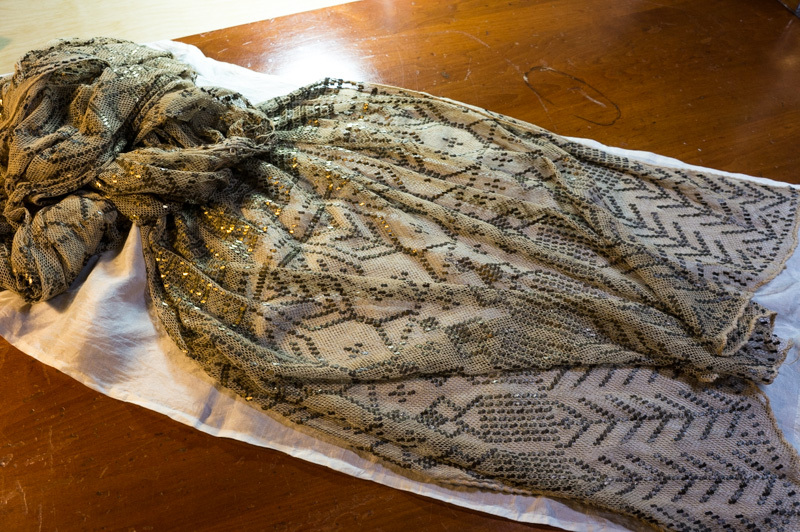 My mom must have given me what I thought of as a "piano shawl" back in the early 1980s. It was Kitty Mom's -- that's all I knew. Bits of metal flattened around netting (see detail below). Despite some tears around the edges, it has been draped across one piece of furniture or another ever since. If it weren't for the tears making it feel delicate, I might have worn it -- it's heavy and sensuous. With my recent interest in textiles, I noticed it again (draped across the low lateral file cabinets in my "morning room"). Now that Google has abolished excuses for ignorance, I went searching. Thin, flat strips of metal are worked into hexagonal mesh fabric known as tulle (hence the arabic term "tulle-bi-telli"). The tulle is fine strong cotton. Thin metal strips of either nickel silver, or copper or brass plated with some mixture of silver- about 1/8th" wide - are threaded into a wide, flat needle with a wide, flat eye. The strips are threaded into the mesh, crossed over, flattened crisply with the fingernails, cut, then flattened into a sort of packet stamped into/onto the fabric. Each bit is about 1/8" x 1/4" long and these oblong dots are worked into designs both geometric and figural. When finished, a huge roller is passed over the textile to flatten the metal down even more. Traditionally worn by Egyptian women in various ways, and highly favoured by dancers. Today Egyptian dancers wear both loose cut and form-fitting beledi dresses to convey the ultimate Egyptian expression of dance costuming. Ah, now my raggedy heirloom has cachet! In the Roaring Twenties, Kitty Mom was in her thirties, a prosperous woman-about-the-town. I wonder if Kitty Mom did wear it as a scarf, along with the hats and furs she loved. Now I'm wondering if the tears can be stabilized by some fine handiwork. And maybe (after 30 years of display) it could use a delicate wash. I'd love to wear it. 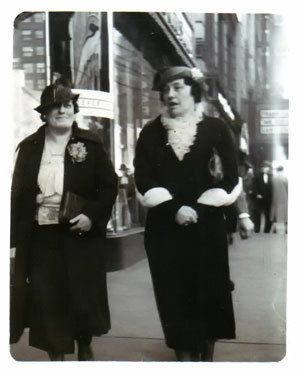 PHOTO #3: Kitty Mom (right) and her friend, on the town. Undated photo (from 1920s or 1930s? ).